Fintech - How Technology is Redefining the Financial Services Industry? You are here: Home / Latest in Personal Finance / How Technology is Redefining the Financial Services Industry – As we know it today! Technology today is rapidly changing the world around us. The wide-spread availability of internet enabled mobile phones has helped the common man to reap the benefits of technological advances in all streams around them. A consumer today can hail a cab conveniently using the smart-phone instead of waiting forever for the public transport to arrive. If you are too busy to go shopping, e-commerce is there for you. You can buy anything and everything right from your daily grocery to your high-end consumer electronic goods to your home furniture! Have plans to go for a movie this weekend? Long gone are the days when you had to stand physically in the queue to get tickets. Now you simply go to the concerned app, choose the movie and cinema-hall of your choice, book the tickets and you are done! Like for other product & services around us, technology is disrupting the financial services too. The way we do banking is undergoing a big change. In the coming years, financial services will be very different from the way we know it today. Fintech has been a buzz-word lately. Fintech or Financial technology in general refers to the new age companies that leverage technology to offer financial services (or) product to the end-consumer. In doing so, they totally disrupt the business models of existing players. These companies use data and mobile connectivity to alter the way the financial products and services are delivered and consumed today. Fintech is about digitizing money & money-related transactions and simplifying your life. You may have not realised but fintech has impacted the various banking services around you. 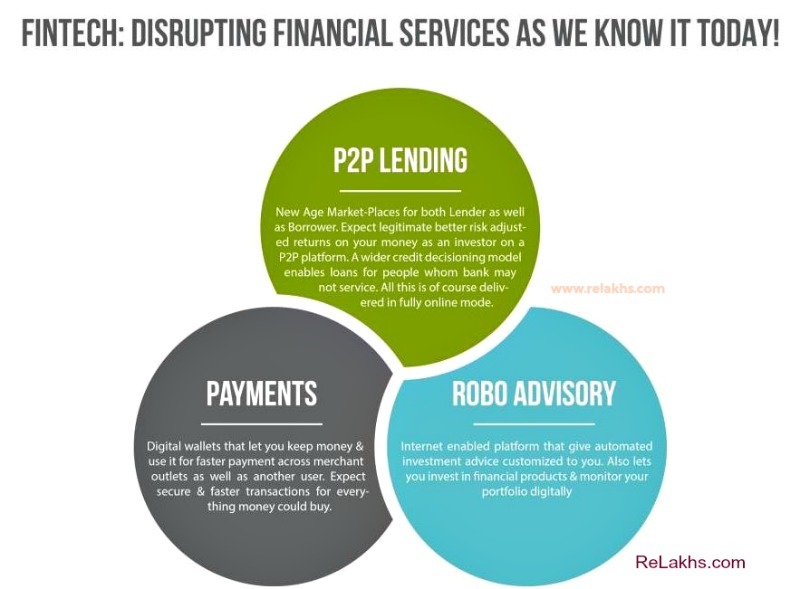 Let us look at the three key financial services which have been altered by Fintech in India. You have long used the banking services for payment. For your everyday merchant transactions, you use cash or cards. When you want to transfer money to someone you use cheques and internet banking. For any internet transactions,you rely upon card-payment and net-banking. Fintech companies have introduced mobile wallets for ease of use and fast, reliable payments. The mobile wallet lets you make payment directly to end-merchant and allows you to transfer money amongst one-another simply with the mobile number as the key identifier! Say you go out for an office-lunch and then you usually split the bill. With digital wallet, all you need is the mobile number of your colleague and transfer the required money with a few simple clicks on your smart phone! There is no need of an account number or to deal in cash! Using a mobile wallet is simple too. Just download the app, create your account and transfer money from your bank account to the wallet. You are good-to-go! You can avoid the hassle of carrying physical cash and do a transaction in seconds. Here is a list of key digital wallets in India. RBI has come-up with a new banking model called as Payments Banks. The entities that are licensed under the “payment banks” can accept a cash deposit up to Rs.1 lakh per customer. They can operate in the deposits, remittance and payments space. But they are not permitted to give loans like a traditional bank. Bharti Airtel and Paytm are the first two players to launch their payments bank services in India. You now have the option to earn interest on your deposits like you do in a regular bank and can make much easier mobile oriented transactions by using these platforms. While fintech has already disrupted the payments and deposits streams of a traditional bank, the loan and credit space is undergoing huge transformation too. Traditionally under-served customers by banks can now have access to credit and loans thanks to the new business models of Peer-to-Peer (P2P) lending and Alternate Credit Decisioning (ACD). P2P lending platforms act as a market-place between the investors and borrowers. So, if you are an individual with investible money you can then lend it directly to a borrower via an online platform and earn interest on it. One, if you are an investor (Lender) with surplus money, you may make better risk adjusted returns. Second, if you are a borrower then you can take simplified loans at better terms through a fully digital experience. Most of the P2P players use Alternate Credit Decisioning methods to underwrite loans. This means that they do not solely rely on the credit score and traditional risk assessment methods to disburse loans. These new-age finance companies consider multiple other data points such as social profile, e-commerce / utility bill expenditure behaviour, employment credentials etc. to assess the credit-worthiness of the borrower. A P2P player can give both personal loans to salaried individuals as well as business loans to SMEs or to both depending on their business model. How Does P2P Change Your Life? Hence, if you could not take loan from a Bank or NBFC till now because you did not have credit history, the new-age P2P players can let you take one. And if you are an investor looking for a return on your money then you can become a lender on these platforms. There are quite a few notable P2P players in India including the likes of Faircent, Lendingkart, IndiaLends, Capital Float, CrediFiable etc. The RBI has not yet brought out regulatory guidelines on P2P lending model. However, it has finalised the regulations on P2P lending and it had earlier brought out a consultation paper on P2P lending in 2016. RBI is likely to target increase the net of financial inclusion through innovative lending practices such as P2P lending. Technology has also altered the traditional investment advisory space. Digital technology and analytics are re-shaping the way you can invest your money today. 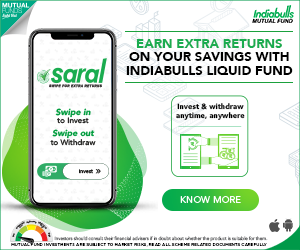 The new age tech-enabled companies in this space can deliver sophisticated advisory related to your money via an online platform and help you invest in financial products such as mutual funds. These platforms are usually known as Robo-Advisory platforms, since they put your investments on auto-mode. When you sign-up on any of the robo-advisory platforms, they first develop your investment profile. They consider various inputs such as your age, income, savings, goal, time-to-goal, investment time horizon and risk appetite. Next, your investment profile is matched with the recommended investment portfolio using smart algorithms. Funds India and Scrip Box are two well-established players in this space. While the robo-advisory model is similar in practice to the traditional investment advisors, the business model gives you a complete digital experience. Before such platforms, tailored investment advisory was available only to the HNI customers. Now with tech-enabled business the investment advice is within the reach of an average common man. You can compare different options and make investment decisions as suited to your life-stage. Fintech companies in India are slowly but surely changing the existing landscape of financial services. Adhaar as a biometric identity proof has enabled digital on-boarding of customers instead of the usual one which required in-person verification. Availability of high-speed internet and smart phones has also been a big enabler in bringing about this change. These new age companies are enhancing the user experience, reducing the transaction time and bringing in cost efficiencies. In fact, these small new age companies have forced the big, traditional banks to re-align their strategies and organisational capabilities to incorporate technological advancements and deliver a superior customer experience. Can the big banks change to match the friction-less experience offered to customers by smaller fintech companies? We don’t know. But one thing we know for certain is that you – the end consumer is going to be the biggest beneficiary of this industrial disruption. 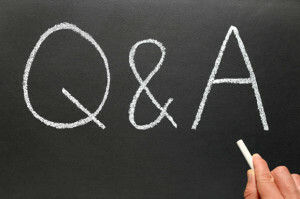 This is a Guest post by Ms. Snehil Gupta of Credifiable.com. Ms Snehil Gupta is leading the marketing & business development for CrediFiable. Snehil has 8 years of experience in financial domain across leading Indian Private Sector Banks & Start-Ups. CrediFiable is a new age P2P lending platform which provides personal loan to salaried professionals through better terms, faster processing time & fully online personal loan process. Kindly note that ReLakhs.com is not associated with Credifiable.com. This is a guest post and NOT a sponsored one. We have not received any monetary benefit for publishing this article. The content of this post is intended for general information / educational purposes only. We advise our blog readers to be aware of the risks associated with Peer to Peer Lending business model, as the RBI is yet to come up with their final regulations on P2P online platforms. 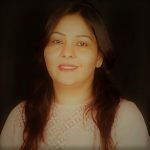 Ms Snehil Gupta is leading the marketing & business development for CrediFiable. Snehil has 8 years of experience in financial domain across leading Indian Private Sector Banks & Start-Ups. nice information, India’s future will be very bright, and in the coming time, India will become a developed country.